The following is an edited excerpt from a forthcoming book by Bianca Mugyenyi and Yves Engler, tentatively titled Stop Signs: A road trip through the USA to explore the culture, politics and economics of the car. Across the globe, sprawling auto-dependent development is pushing oil extraction into increasingly sensitive environments. Far from the “light sweet crude” of the Niger Delta, the heavy oil trapped in Alberta’s tar sands is among the filthiest sources in the world; with up to three-quarters of the final product destined for the US market, tar sands oil extraction has been labelled the most destructive process known to mankind. Viewed from above, the tar sands are as picturesque as a pair of dirty lungs and the stench of tar can be smelled for miles. Amid a tangle of pipes, waste ponds and smoke, an environmental demolition derby of 50 ft, 300-tonne monster trucks roam a wasteland riddled with 200-foot-deep open pits. Gouged out with dinosaur-sized claws, Athabascan oil is mined, not pumped. Describing the tar sands as “hideous marvels,” Globe and Mail columnist Jeffrey Simpson writes: “They are terrible to look at, from the air or from the ground. They tear the earth, create polluted mini-lakes called tailing ponds that can be seen from space, spew forth air pollutants such as sulphur dioxide and nitrogen oxide and emit greenhouse gases such as carbon dioxide." “They are voracious users of freshwater,” continues Simpson. Extracting the bitumen (crude oil) from the thick and sticky mix of clay, sand and water is no easy feat and for every barrel of oil extracted, somewhere between two and four-and-a-half times as much water is needed to thin-out the mixture and separate the bitumen from the sand. To obtain this staggering volume of water, whole streams and rivers in the region have been drained and diverted. We don’t need Erin Brockovich to tell us something is wrong with the water; sucked out for the extraction process and then spat out again, most of it ends up contaminated with acids, mercury and other toxins. This wastewater has left Northern Alberta studded with toxic dumping pools, better known as ‘tailing ponds.’ Not only are the tar sands being blamed for Western Canada’s first ever bout of acid rain, the residues pumped into the Athabasca River have increased cancer rates downstream, particularly among First Nations communities dependent upon the waterway. The history of oil extraction has always been the history of suffering and the tar sands are no exception. To produce a single barrel of oil, the tar sands extraction process requires two tonnes of sand. In 2003, Alberta’s Environment Ministry reported that 430-square kilometres of land had been “disturbed” for the oil sands. By summer 2006, that number had reached 2,000-square kilometres, nearly a five-fold increase in three years(even though only two per cent of the oil sands--now hailed as one of the world’s largest reserves--had been developed). Thousands of acres of trees have already been clear-cut to make way for tar sands mining and if current plans unfold, a forest the size of Maryland and Virginia will be eliminated. The decline in forests has led to a major reduction in both the region’s grizzly bear and moose populations, with oil exploration also harming prairie birds and other animal life. The environmental mayhem so far described is the tip of the iceberg. The tar sands represent the biggest increase in Canadian carbon emissions, with every barrel of synthetic oil produced releasing 188 pounds of carbon dioxide equivalent into the atmosphere. Comparing the greenhouse emissions of a conventional barrel of crude to a barrel of tar sands oil, a New York Times article noted that, “A gallon of gas from oil sands, because of the energy-intensive production methods, releases three times as much carbon overall as conventionally produced gasoline.” The oil sands are located in and around Fort McMurray (aka Fort McMoney), a region with a population of 61,000. 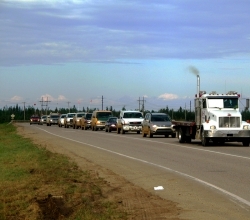 By 2015, Fort McMurray is expected to emit more greenhouse gases than all of Denmark. Describing “the rush into the oil sands” a Wall Street Journal analyst writes: “For years, environmentalists have argued that higher gasoline prices would be good for the Earth because paying more at the pump would promote conservation. Instead, higher energy prices have unleashed a bevy of heavy oil projects that will increase emissions of carbon dioxide.” Rather than deter exploration, rising prices have led to increasingly unconventional and hazardous oil exploration exemplified by the Alberta tar sands. With over a hundred billion dollars projected in oil sands investments between 2006 and 2016, the industry is looking for a long-term, cost-effective energy source. High natural gas costs have the tar sands companies thinking big and looking north. Not everyone is happy about this increasingly sticky situation. “Don’t ruin our land to fuel the US gas tank,” demanded Grand Chief of the Deh Cho in response to the proposed Mackenzie Valley natural gas pipeline, which, if built, would ship natural gas almost exclusively for use in northern Alberta oil extraction. The natural gas pipeline seems almost benign compared to some of the ideas being floated by some oil companies who are described in the National Post as “warming to the idea of nuclear power as a source for their massive energy needs.” This is not the first time nuclear power has been proposed to liberate crude oil from the tar sands. In 1959 California's Richfield Oil drew a plan approved by the US Atomic Energy Commission to separate bitumen from sand by detonating a nine-kiloton atomic bomb. It was argued that the heat and energy created by an underground explosion would free the oil from the sand, but after the success of initial tests in Nevada, the idea was shelved due to concern among Canadian officials over the use of the A-bomb. Submitted by Ruth Butler (not verified) on Mon, 2008-12-08 15:44. Doesn't anyone drive cars in Canada? if so what do they run on? "increase emissions of carbon dioxide"
just like those horrible emissions humans exhale? Submitted by Anonymous (not verified) on Wed, 2008-12-10 02:13.
nope. they drive around on magic waffles fueled by maple syrup. good point though. Submitted by Mario Brunet (not verified) on Sat, 2009-03-21 16:12. Typical response from genocidal racists. Why should we bear the brunt of this American demand for oil. Curtail production to today's numbers for the next 20 years and find real environmental solutions and go after the polluters before it's too late. You think these bozos will clean up before they leave. Ha. Submitted by Josh Brown (not verified) on Thu, 2010-09-16 07:09.